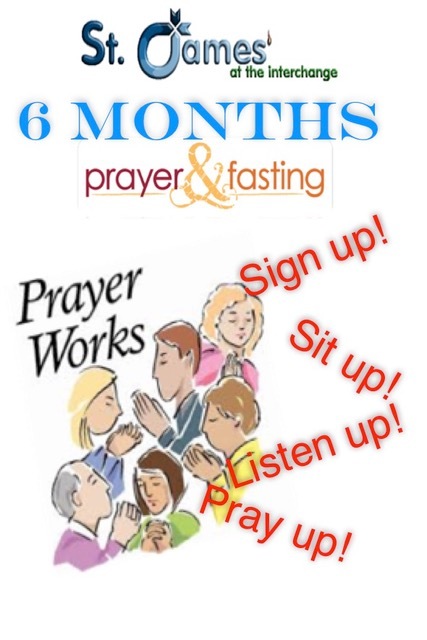 The congregation at St James Church began a season of prayer and fasting which began on the first Sunday in March 2018 and will run to the first Sunday in September. But why stop there ? - we may keep going and make it a life-style choice. We declare today that we will fast and pray before you the living God. We will see You and humble ourselves before You that your kingdom might come here in St James' and Your will be done more fully in our lives. We will honour one another and seek to bless one another above ourselves. We ask you to do as Jesus promised and build Your church here. Now send Your Spirit to strengthen us and enable us to complete this task. We pray in Jesus' name. Amen. You would be most welcome to join us in this worthy endeavour and also receive training in prayer and fasting through a season of Sunday sermons on this subject.